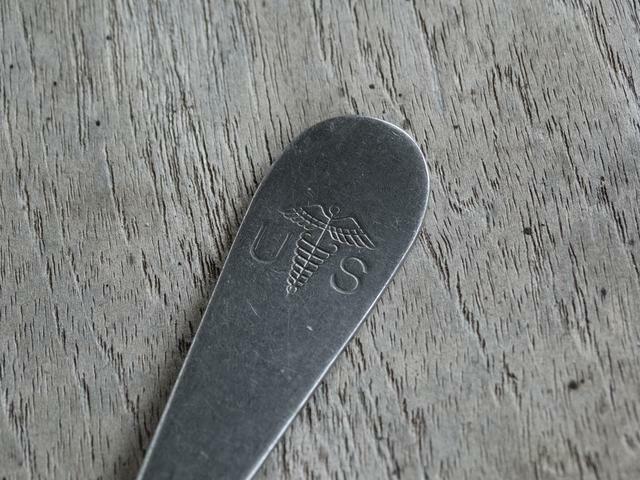 I got this spoon in some hand-me-down silverware and wondering what the symbol means. I thought it looked like something medical or veterinary but the US had me thinking armed forces. Medical absolute. Pretty sure that is a winged needle surrounded by thread. I've come across it a few times in my life. I've seen that symbol about a million times. Almost every day growing up, still to this day it is my Mom's favorite serving spoon. backhoeboogie wrote: Medical absolute. Pretty sure that is a winged needle surrounded by thread. I've come across it a few times in my life. Nope. 2 venomous serpents intertwined around a staff.